Things to know about installing on your Procare Touch computer. If you prefer written directions, see: Touch Mount Assembly Instructions. Required: Install Windows Updates! Make sure the Procare Touch Computer has internet access then install the latest Windows Updates. Go to Start > All Programs > Windows Update. Required: You’ll need your Installation Key Number to install Procare. It appears in the lower right corner of the Procare Home screen (if you already have Procare installed on another computer, this is an easy way to find the number). It can be found in your Welcome to Procare email. If you can’t find it, contact Technical Support for your Installation Key Number. Optional: Keyboard and Mouse—Although the touch computer does not come with a mouse or keyboard, you may wish to connect your own USB mouse/keyboard for installation and setup purposes. Or, use the Windows on-screen keyboard instead of a physical keyboard. For Windows 10 the on-screen keyboard is available in the lower right corner of your taskbar. For Windows 7 go to Start > All Programs > Accessories > Accessibility > On-Screen Keyboard. If you are using the Procare Cloud service, download/install the software from the Welcome to Procare Cloud page. If you haven’t already done so, install Procare on your main computer (server). 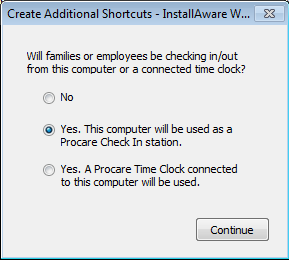 Install the latest Procare online update at the main computer. From the Procare Home screen go to Utilities > Check for Online Update. Make sure the Procare Touch Computer is connected to your network so it has access to the main computer. You may need assistance from a local computer technician. Choose to Run setup.exe (this may appear at the bottom of your screen). Say Yes to allow Procare to make changes to the computer. When you reach the Quick Setup screen be sure “Client Computer / Workstation” is selected as the role for this computer.